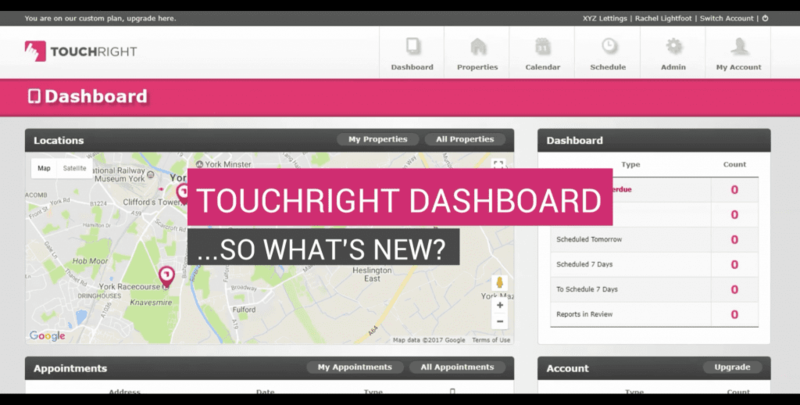 We’re delighted to announce the updated TouchRight V5 dashboard is now live along with our iOS app. The Android app will follow in March (watch this space for details)! User engagement and feedback is invaluable to us and we have used this in every aspect of our V5 software development, to make property reporting even more efficient, user-friendly and cost-effective for you! A familiar dashboard with a few twists! We’ve maintained the look and feel of the dashboard that customers know and love, but we’ve freshened it up and added more space so that it’s easy to view all property and reporting information. Using report linking is useful so that the last report information can be viewed at the property for comparison. We’ve now improved the appointment scheduler to make linking even easier. You’ve always been able to tag your repairs in TouchRight for follow-up, and now you can add multiple repair issues into a single PDF report. Great for selecting all ‘cleaning’ or ‘maintenance’ issues for your contractors. No more fixed templates! The new report sidebar conveniently allows you to rename, move and hide rooms for each report. In addition, workflow can be tracked, by viewing the status of rooms using a new traffic light system. New and improved account reporting provides clear visibility of your account activity, detailing ‘when’ your reports were completed and by ‘whom’. Reports can then be filtered and downloaded for internal reporting. More and more customers are sending their reports via TouchRight. Now you can personalise your emails by using our new customised email templates! These work well alongside your personalised signatures. Our new RESTful API means that TouchRight can now connect with even more industry platforms. It’s now even easier to upgrade TouchRight custom pricing plans. Upgrade at the click of a button using our updated GoCardless integration! Our Signable and LetMC integrations will shortly be available, along with the brand new Android app. For more detailed information about these new features, take a look at our new ‘How To’ playlist on YouTube here.